3 We were… brainwashed to think only like a white person. Most of us girls were thinking white in the head but were feeling black inside. We weren’t black or white. We were a very lonely, lost and sad displaced group of people We didn’t know anything about our culture. We were… brainwashed to think only like a white person. When they went to mix in white society, they found they were not accepted, [as] they were Aboriginal. 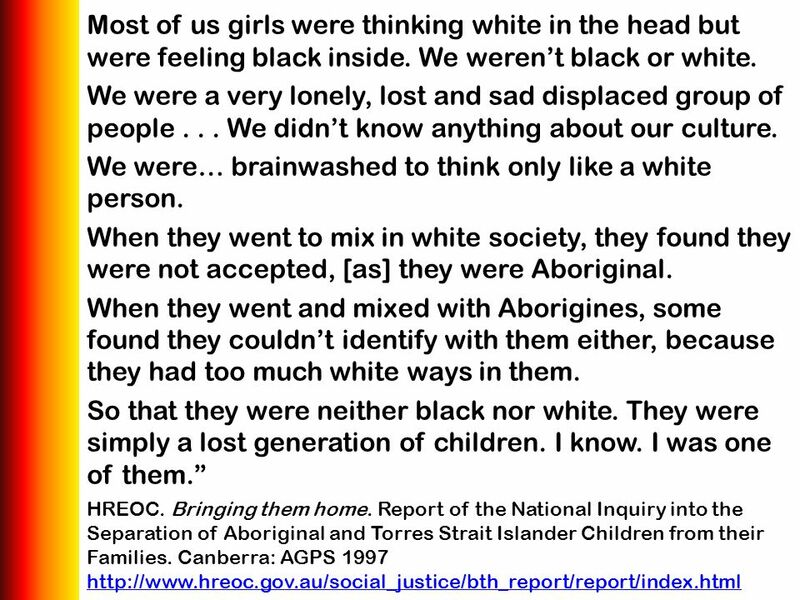 When they went and mixed with Aborigines, some found they couldn’t identify with them either, because they had too much white ways in them. So that they were neither black nor white. They were simply a lost generation of children. I know. I was one of them.” HREOC. Bringing them home. 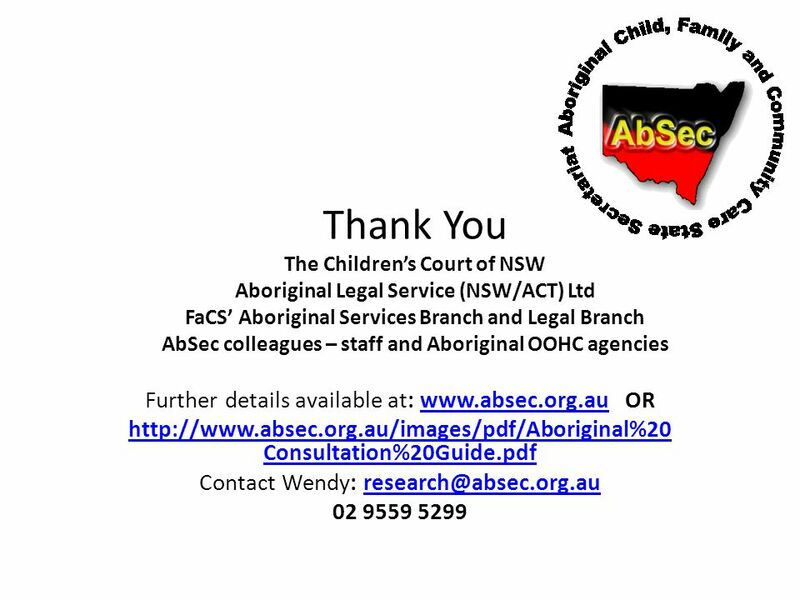 Report of the National Inquiry into the Separation of Aboriginal and Torres Strait Islander Children from their Families. Canberra: AGPS Stolen Generations – systematic history of forced removal of Aboriginal children from their families and it’s impact on the kids you represent today Cultural identity and its importance to Aboriginal children and young people in care Most if not all people who were removed from their families in the past, and CYPs in care today will have issues to deal with because of their removal Where children are not only removed from their parents, but from their extended family, grandparents, cousins, aunts, uncles, community and culture, particularly where they lose connection with those and are placed in another culture there’s another level of “hollowness” that underlie all the other issues that all children and young people in care can face The first question Aboriginal people often ask each other when meeting initially is: “What’s your name, who’s your mob, where you from? 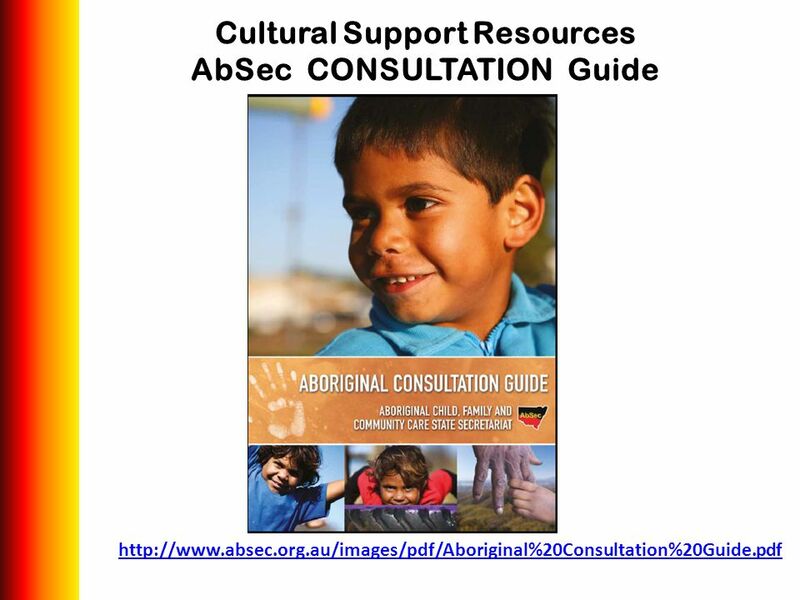 !” Not being able to answer can be confronting, painful and alienating for any Aboriginal person. 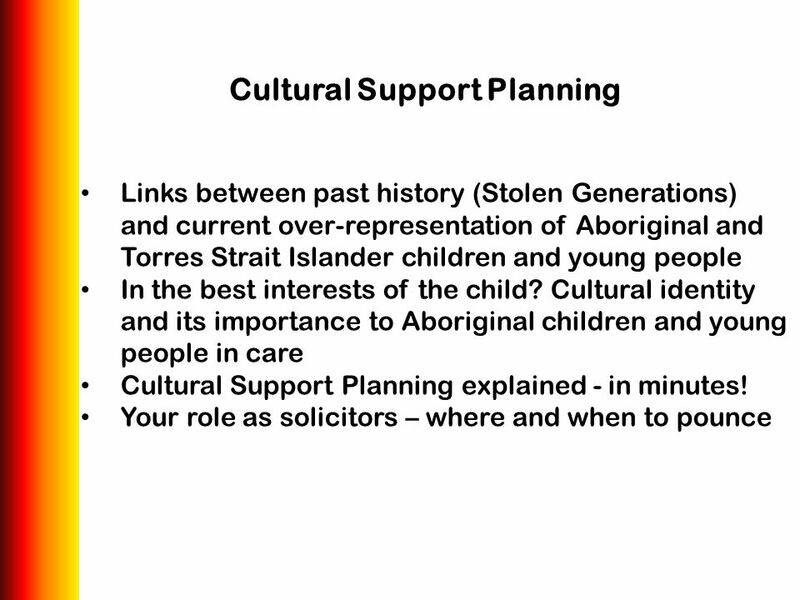 The aim of cultural care planning is to help Aboriginal children and young people in out of home care to strengthen their sense of identity, belonging, wellbeing and pride in who they are, so they know, as much as possible, answers to questions as important as these. 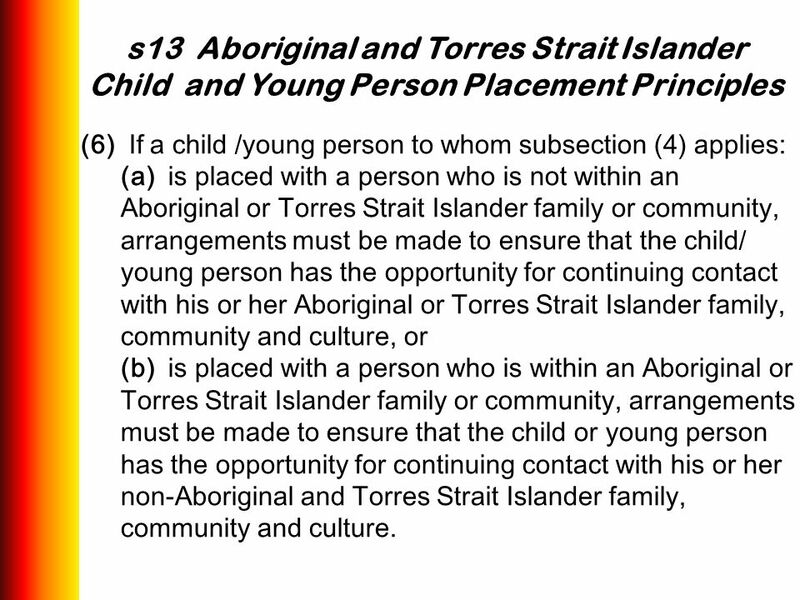 Child and Young Person Placement Principles (6) If a child /young person to whom subsection (4) applies: (a) is placed with a person who is not within an Aboriginal or Torres Strait Islander family or community, arrangements must be made to ensure that the child/ young person has the opportunity for continuing contact with his or her Aboriginal or Torres Strait Islander family, community and culture, or (b) is placed with a person who is within an Aboriginal or Torres Strait Islander family or community, arrangements must be made to ensure that the child or young person has the opportunity for continuing contact with his or her non-Aboriginal and Torres Strait Islander family, community and culture. Protective and a source of resilience and wellbeing – culture as indivisible from an Aboriginal child’s best interests Child viewed in the context of the whole family and the whole community – not separate Day to day – embedded Enables connections, helps Aboriginal children/young people feel a part of their culture and not a stranger to it, to know their own identity, where they fit, where they belong Spending time with mob through contact  specialist identity counselling Cultural supports are the important, protective aspects embedded in day to day out-of-home care, that help Aboriginal and/or Torres Strait Islander children and young people to know, live and feel a part of their culture. 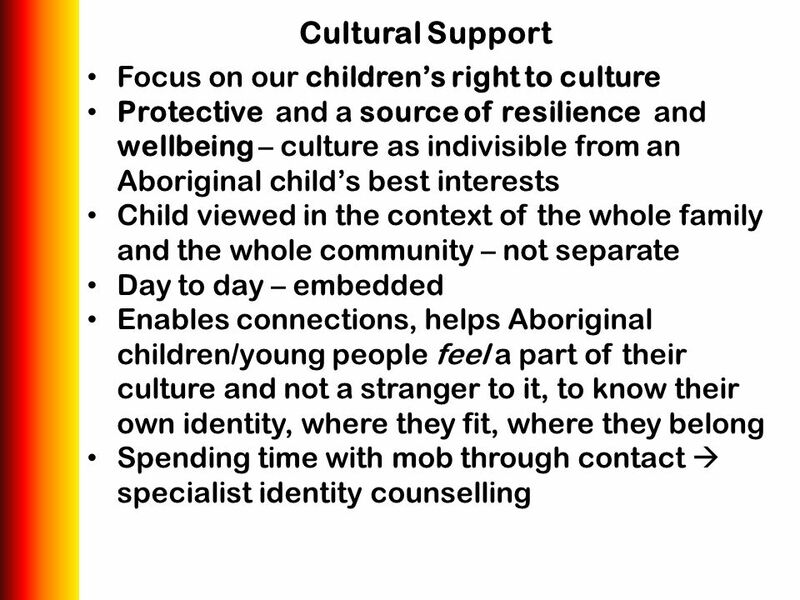 Cultural supports can help a child or young person to develop and maintain their cultural identity, connection and sense of belonging to their family and community and to feel an appreciation and pride in their culture. 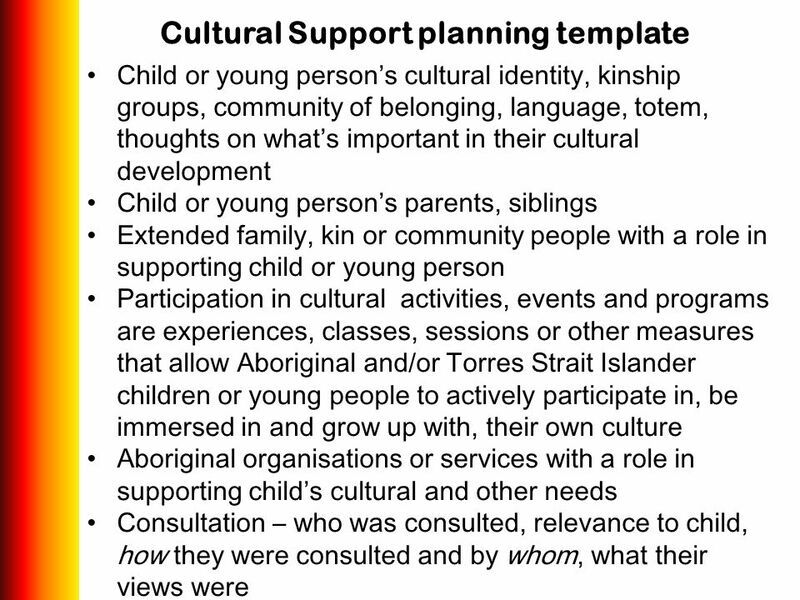 Well planned supports can help prevent an Aboriginal and/or Torres Strait Islander child or young person from becoming isolated from their own culture and people, particularly when they are not growing up in their own culture with their own family, with relatives or kin carers or with Aboriginal foster carers. 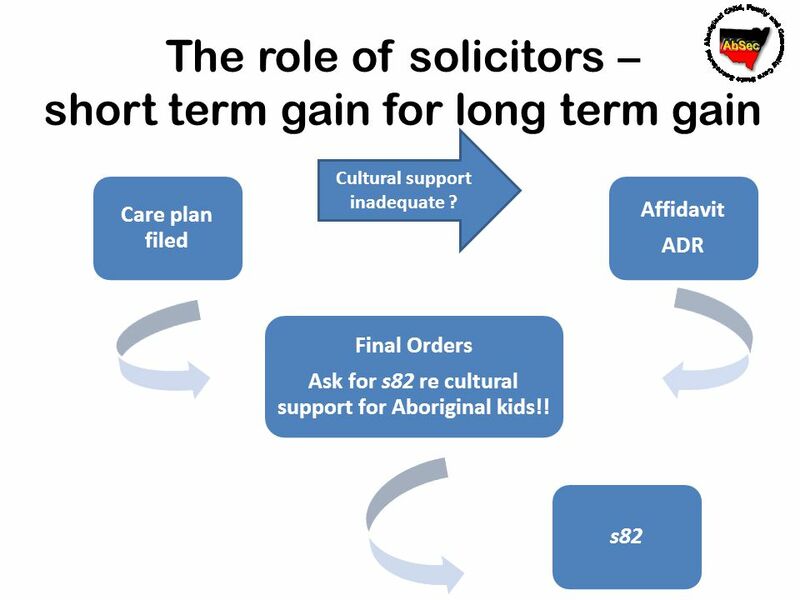 Application of adequate cultural supports involves recognition of the critical role of extended Aboriginal and/or Torres Strait Islander family and significant community members, such as elders, in contributing to planning and in providing ongoing cultural support. 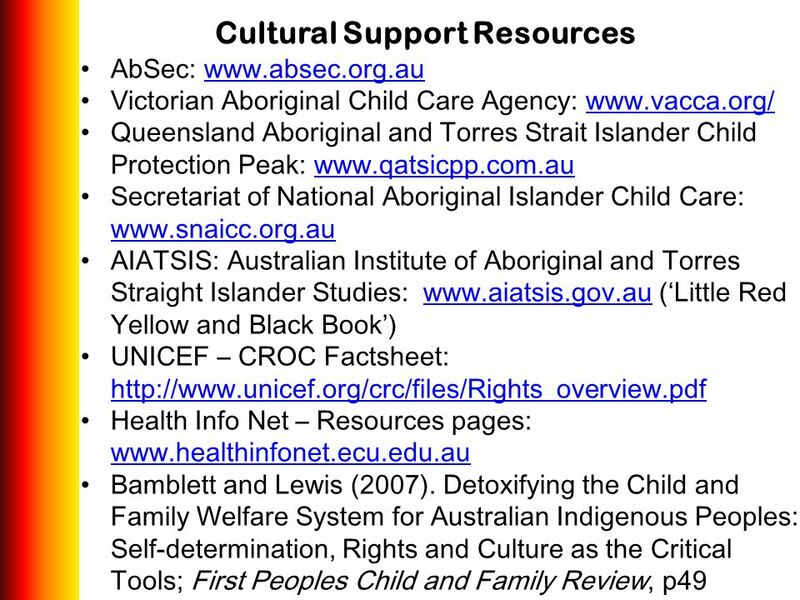 Cultural supports can be ascertained by determining the child or young person’s cultural needs and personal circumstances, their knowledge of and connection with their culture and the extent to which they identify, their knowledge and connection with family, extended family, kin and community. 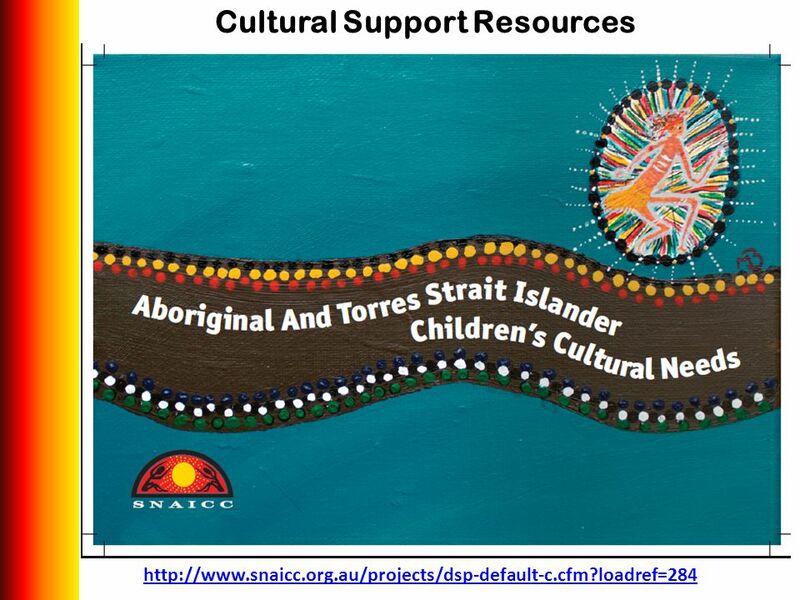 Cultural support mechanisms can vary from ongoing specialist identity counselling or mentoring from significant people from the child’s community, to simply having more contact time to connect with extended family, through family visits or attendance at family occasions Support may include: • an Aboriginal or Torres Strait Islander mentor • provision of books, artwork or information from the internet that relates to the specific cultural groups of that child • someone attending community events with the carer for the first time • introducing carers to key community members • contact by the identified Child Safety Support Officer or the recognised entity to help the carer understand the child’s history, culture and current issues • providing the carer with an annual events calendar • providing the carer with a list of local Aboriginal and Torres Strait Islander services and contacts and particularly those who have a personal connection to the child • attending relevant training programs or workshops. Child or young person’s cultural identity, kinship groups, community of belonging, language, totem, thoughts on what’s important in their cultural development Child or young person’s parents, siblings Extended family, kin or community people with a role in supporting child or young person Participation in cultural activities, events and programs are experiences, classes, sessions or other measures that allow Aboriginal and/or Torres Strait Islander children or young people to actively participate in, be immersed in and grow up with, their own culture Aboriginal organisations or services with a role in supporting child’s cultural and other needs Consultation – who was consulted, relevance to child, how they were consulted and by whom, what their views were Cultural support planning template cultural activities, events and programs are experiences, classes, sessions or other measures that allow Aboriginal and/or Torres Strait Islander children or young people to actively participate in, be immersed in and grow up with, their own culture. These may be formal, organised measures or less structured more informal activities with extended family and community. Authentic, well-conceived and delivered activities can help develop a child or young person’s interest, cultural knowledge, skills and confidence. They also provide an opportunity for a child or young person to establish or maintain connections with their extended family and community/ies and develop a sense of belonging in their culture. Cultural support inadequate ? 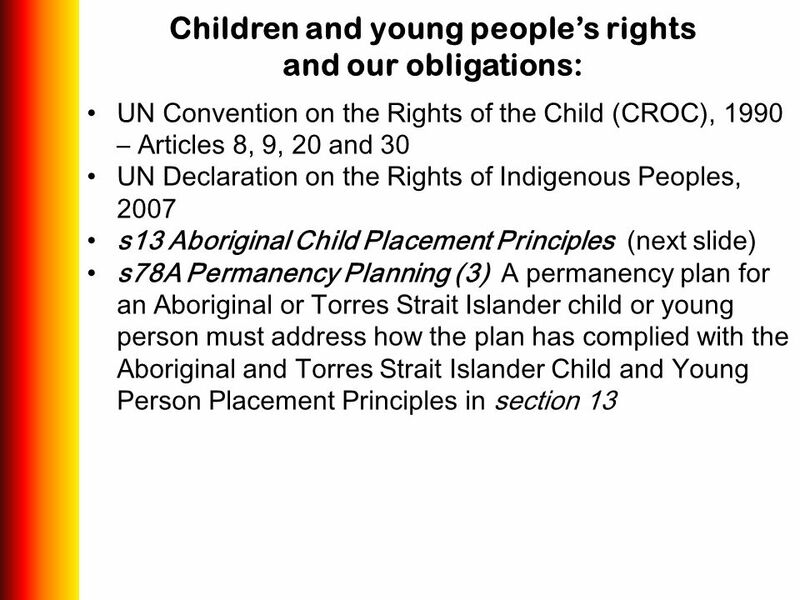 Care plan filed Ask for s82 re cultural support for Aboriginal kids!! Final Orders s82 Affidavit ADR A lot of problems because of SHORT CUTS The front end work viewed as too much, too involved, too hard, too many hard questions – seen as short term pain!! FacS send care plan to Children’s Court Solicitors/child reps get the care plan around the same time If all parties happy  final orders If not, file affidavit and/or matter moves to ADR if parties are in disagreement, or to a hearing Court needs to be satisfied permanency needs have been properly met Developing template – to be discussed in a minute! Download ppt "Cultural Support Planning with Aboriginal Children and Young People"
Supporting the teaching of mental health through health and physical education AISNSW conference 22 May 2009 Using the Internet and game-based technology. MakingtheLink: Promoting help-seeking for drug use and mental health issues among Aboriginal and Torres Strait Islander high school students Karina Hickey. Moving curriculum forward: NSWAECG Annual Conference Friday 15 March 2013 balancing national, state and local interests. ETL203 week 5 Indigenous learners and mathematics Come…meet us half way. The future of nursing and midwifery – Where are we heading? Education Scotland Curriculum Impact Report Health and wellbeing: the responsibility of all A summary guide to the findings for children and young people. Implementing HSIE K-6 Using the syllabus for consistency of teacher judgement Implementing HSIE K-6 Using the syllabus for consistency of teacher judgement. Mainstream Service Challenges to Improving Access to Legal Aid. 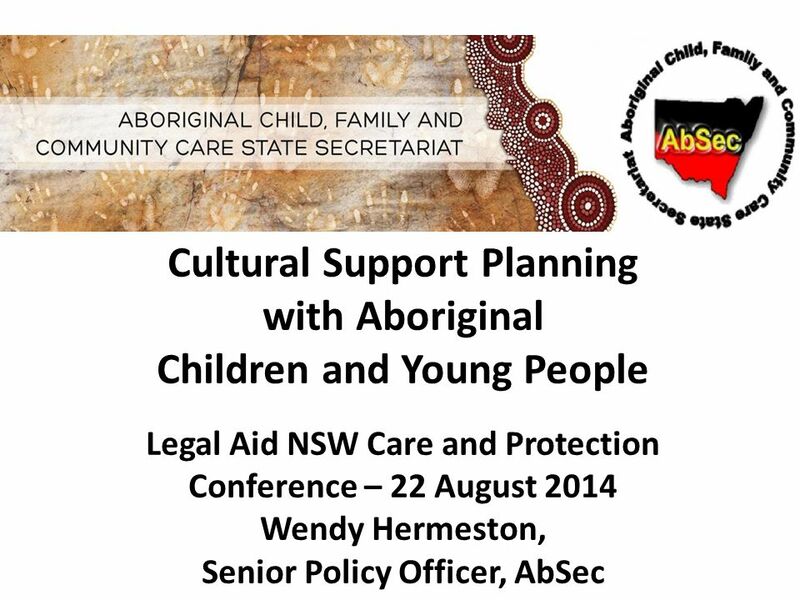 Improving Aboriginal and Torres Strait Islander Cultural Support in Out-of- Home Care.